When The Demon's Watch arrived in the post, I was quite taken by the blurb on the back, so I hassled the lovely Lauren at RHCB to find out what inspired Conrad to write the book. Lauren as always came to my assistance and here I have a lovely post by Conrad Mason, author of The Demon's Watch. Thank you for having me on your blog Viv! You've asked me to talk about the inspiration behind my book The Demon's Watch. So first we need to go back to me as an 8-year-old, reading my first Redwall book. 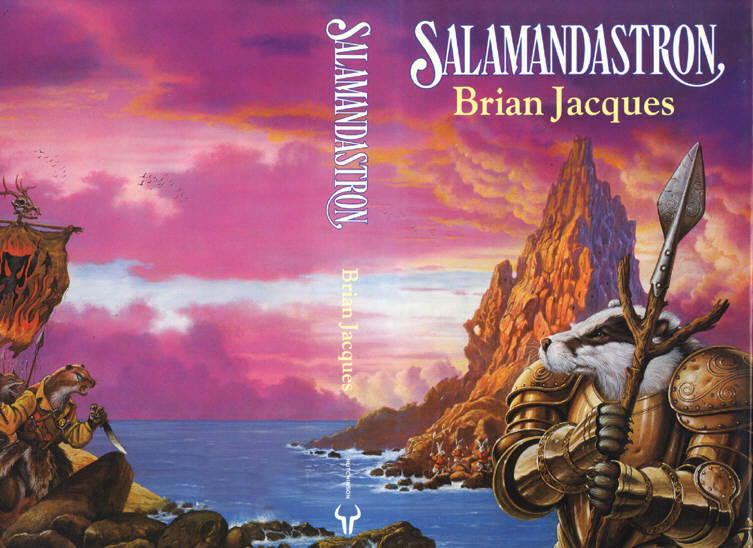 I think it was Salamandastron, which had the most incredibly exciting cover I'd ever seen... A badger in golden armour, carrying a spear. I tore through all the Redwall books. I read them again. I listened to the cassette versions. The death of a character in Martin the Warrior left me in tears all day, and I'm not sure any book has floored me in quite the same way since. In fact, I'm not sure I would have become a writer if not for Brian Jacques. But there was something which bothered me about these books. In the world of Redwall, some animals were good (mice, squirrels, hares...) and some were bad (foxes, weasels, ferrets...). I never really understood what it was that made a fox bad. Or a weasel, or a ferret. It didn't seem fair. When I was a little older, I read Tolkein and found something similar. Elves were good. Dwarves were good. Goblins were bad. (I'm oversimplifying here - but that's how it seemed to me at the time.) That was the first idea which led toThe Demon's Watch. Why did a goblin have to be bad? And what would happen if you wrote a fantasy story about a good goblin? I used to think about this sort of thing a lot during the summer holidays, when my family would often go to stay in Cornwall. We spent our days on the beach, and on clifftop walks. My dad and I went out sailing in dinghies. I've always loved the sea, and I became more and more interested in the maritime history of Cornwall - creaking wooden sailing ships, revenue men, smugglers... I began to think it would be fun to write a story set in an 18th century port. Over the years, these two ideas got jumbled up in my mind. On the one hand, a story about a good goblin, with elves, trolls and magic. On the other hand, a story of galleons, pirates and cutlasses. What was to stop them being the same story? One day, I sat down and wrote a short scene. It was about a ship coming into a port at night, during a storm. A smuggler's ship, crewed by humans, trolls and goblins. There was a cargo on board which would make their fortune - a mysterious object wrapped up in black velvet. I wanted to find out what happened next. So I kept writing. And three years later, I'm beyond excited to see The Demon's Watch in print at last. Now I know you are desperate to know more. So here is the trailer for the book. We are planning to buy Niece #2 a copy of this for Easter after which I'll borrow it from her. A great post, I can remember reading Salamandastron to a class full of primary school children a while ago ....... I don't know who enjoyed it the most, them or me. Great guest post. The Demon's Watch sounds like a fun book! Great post. It's awesome to know that the Redwall books inspired you, Conrad, as my boss has been telling me I need to read some of them as she loved them when she was younger too! Thanks guys! Raimy, you absolutely need to read them. Particularly for the feasts. The way he describes food is just... well. See what you think!